As an executive and luxury chauffeur driven private airport transfer service, Cars Exec has many years of experience in airport transfers in the UK. We offer a range of vehicles to suit your specific airport transfer requirements for luxury, comfort, style and convenience. Whether there is a large group of you, or only two of you, we have the perfect chauffeur driven car hire airport taxi for you. 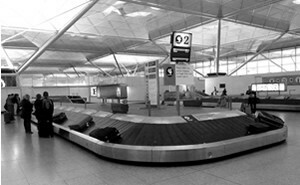 We constantly check your flight times and look out for any delays, so there is no need to worry about your executive chauffeur taxi waiting for you at London Stansted Airport, as they will re-arrange to meet you in line with the arrival of your flight. All our professional drivers will meet and greet you at the airport before taking you on a smooth and comfortable journey to your required destination. A member of our team will await your arrival at a designated meeting place, with your name on a board. Once you have met with your driver, they will then assist you with your luggage. For executive airport transfers to London Stansted Airport and the surrounding area, Cars Exec can help. To book your private airport transfer today, please call or use our online booking form.